A simple fresh tomato salad made with red onion, arugula/rocket, olives and red wine vinegar. This salad is perfect for lunch or as a side with grilled fish or meat. Slice the tomatoes and red onion into fine slices (slice the red onion as thin as possible). Add the arugula to a bowl, drizzle with a little olive oil (around a tsp) and add the squeeze of lemon along with a small pinch of salt and pepper. Toss so the arugula is coated in the dressing and arrange on a serving plate. 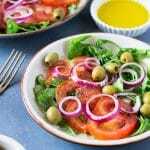 Top with slices of tomato, red onion, and olives. Drizzle over 1 tbsp of red wine vinegar and sprinkle with a pinch of salt of pepper (make sure the tomatoes are seasoned well). Finally drizzle over the remaining olive oil and serve.